The plant takes its name from digitus, the Latin word for finger and was so called long before official Linnean nomenclature was the practice. 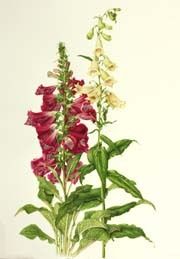 The common English name, foxglove, may have originated from folk’s (woodland folk or faeries) glove. The elongated bell-shaped flowers so easily fit the tip of a finger that their resemblance to a glove or a thimble is unmistakable. In Germany, the plant was called fingerhut or thimble; in Ireland Dead Man’s Thimbles; in Norwegian, Revbielde, meaning “Foxbell,” the only specific reference to fox.